Chambery Airport (CMF) or Chambery Savoie Airport, situated just 5 miles North from Chambery itself in ‘Le Viviers du Lac’ in the province of Savoie. 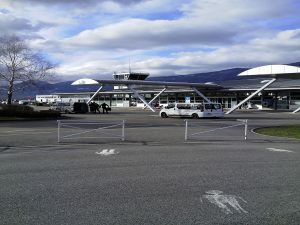 The airport is also known as ‘Chambéry Aix-les-Bains Airport’ and in French ‘Aéroport de Chambéry-Savoie’. Although Chambery airport is a small International airport, it has seen a large growth in passenger traffic over the past few years and now has over one million people pass through it each year. This is mainly due to the many low cost airlines that now service the airport, which makes it an attractive low cost destination as a gateway to the Alps. Chambery airport now has over 1 million passengers per year and is continuing to grow in popularity. This is mainly because of it’s fantastic location and accessibility to the French Alps, which play host to activity seekers in both summer and winter months. Although the Alps are a large attraction for many visitors, the regions that suround Chambery have a vast variety of attractions to offer such as spas, lakes, major cities, shops and much more. One of the main advantages of Chambery airport, is that it is not situated in a large city like many other airports. This makes getting too and from Chambery airport much easier, as you are not fighting against as much traffic. The airport is ideally located next to the A41 which provides instant access to cities such as Lyon and Geneve and the world class ski resorts of Chamonix, Courchevel and Val d’Isere to name but a few. In fact, Chambery airport provides a gateway to over 100 ski resorts acroos the Alps. You have a range of options when it comes to transfers from Chambery airport, including car hire, coach, bus, taxi or private shuttle. Obviously it is up to you and your budget as to which you choose and if you have booked through a holiday company and are on a package deal, your transfer will be provided. This is an option that is certainly worth considering, especially if there are a few people traveling in your party. I say this because through experience, it can sometimes work out much cheaper to hire a car and share the cost, than to all pay individual fares on a coach or for a taxi etc. The added bonuses being, you have transport for the duration of your stay (always a plus in some ski resorts where transport is necessary to get to the slopes) and you do not have to wait around for other passengers. There are many car hire companies operating from Chambery airport, making Chambery car hire a very cost effective option for transfer. Chambery airport is used as a gateway to the Alpes and has a large percentage of it’s passengers throughout the winter months. If you are one of those passengers traveling to Chambery and wishing to get to one of the fantastic ski resorts that the region has to offer, I would strongly consider car hire, especially if there are a few people traveling in your party. As I am sure you will soon discover, coach and taxis to the ski resorts are not cheap and by the time your group has paid individual fares for coach or taxis, it can be just as cheap to hire a car! Especially if you book in advance. Many major companies operate from Chambery airport, which means you can book with confidence and piece of mind. All the companies offer competitive prices and to save you time surfing the Internet, we have listed some of the companies, which consistently offer the best prices on car hire. Obviously, you can surf the Internet yourself but I am sure if you take a look at the companies listed on the following page, you will find a good deal that suits your requirements and budget. Obviously, it is your decision and only you know how much your budget will allow for transfers but it is worth considering and checking out the prices to compare it with every other option. The beauty of hiring a car, is that you have transport for the duration of your holiday, which can be a necessity in some ski resorts and it also eliminates queuing and waiting for other passengers at the airport. It also allows you the freedom to set your own schedule and see more of the region in which you are staying. It also allows you to be able to visit other ski resorts close by that you maybe would not have thought about skiing, had you not had access to a car. There are a huge variety of ski resorts accessible from Chambery airport and having a car allows you to take your pick! The great thing about Chambery airport, is that it is not in the city unlike many other airports, which mean it is relatively easy to access the autoroutes. The airport is situated close to the A41 Autoroute and this provides access to major cities and ski resorts. There is a shuttle bus that connects passengers from the airport to Chambery and Chambery train station. This proves a popular option for passengers in the winter months whom wish to link with the train station and then catch a train to Bourg st Maurice and other stations near ski resorts. As you can imagine, Chambery is very busy throughout the winter and as a result, provides a very efficient ground service with many coach and bus companies providing regular services to all the main ski resorts. However, out of the ‘ski season’, the majority of these services are not available and if they are, are not as frequent. Taxis operate from outside the airport terminal. It is always advisable to ask the driver how much the fare will be before getting in the taxi. A taxi from Chambery airport to Chambery centre is usually around 25 euros (at the time of writing).